We offer specialised classes for beginners, which have been finely tuned and perfected to provide the highest standards and introductions to the martial arts world. We run genuine black belt academies and have literally trained hundreds of students to black belt level and way beyond. We have black belts from the ages of 8 years old, all the way up to black belts aged 65+. All of them have started in our expert beginners classes. This fact itself is testimony to the quality of our schools and dedication shown by our team of senior instructors and students. If you commit yourself to train with us then you too will one day wear the black belt with pride. There are many alternative martial arts schools that make claims to be black belt academies but cannot back this up with the facts. All potential students are more than welcome to come and watch our black belt classes to see for themselves. All our schools are registered with the International Taekwondo Federation, the world’s most recognized taekwondo association, and established by the founder of taekwondo himself. Our commitment to excellence means that our senior instructors regularly travel around the world to train with the world’s highest masters. This allows us to pass the highest standards of martial arts to our students. This privilege also ensures that all our students get grades and qualifications that are internationally recognized across the whole world and to be part of a worldwide recognized body. Most of all, we want to make martial arts FUN and REWARDING for you. We want to give you unforgettable experience in martial arts. We are so confident that regardless of your age, size or abilities, you will thoroughly enjoy learning martial arts with us. We want to offer you a FREE TRIAL CLASS with us to see for yourself the benefits you can get from learning martial arts with us. other parents to join in with their kid’s and see how close your bond grows. Classes are mixed with adults and children, and there is a real community feel & spirit about Palcic TKD, with many new friends having been made since we started. All the instructors are very supportive and accommodate for different fitness levels, helping you with your individual needs, so Tae Kwon Do is suitable for everyone, no matter what your age”!! Palcic Taekwondo founder, Mr Paul Palcic VI, has over 28 years experience in martial arts including Taekwondo, Karate, Kickboxing, Tai chi, Ba Gua, Aikido, Boxing and many more. He has trained with and under some of the most famous Taekwondo master’s in the world. He also makes it his business to train privately with many of the best instructors available in their chosen disciplines. Paul’s lifelong love of Martial Arts, Allowed him to grade for his Black Belt when he was just sixteen years old, under the examination of the world famous Taekwondo master – Hee Ill Cho. 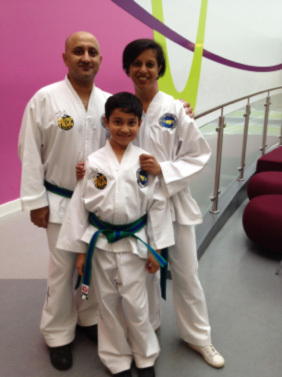 In his younger days he regularly competed, winning several national tournaments, and at just 15 years old was selected to represent LUTON TAEKWONDO adult team in the national championships. This was a real privilege, as in those days (1986), Luton was the second most feared tournament club in the UK, and Paul was even younger than the youngest age limit usually allowed entering. At just 18 years old, Paul discovered his true talent for teaching martial arts, when he started teaching on behalf of his own instructor – Master Sahota. Paul quickly realised that this was a passion that he wanted to dedicate his life to, and opened up his first school when he was at Sussex University studying philosophy. A highlight in Paul’s Career came on the 10th September 2000, when he successfully graded for his 4th degree black belt, under the founder of Taekwondo – General Choi Hong Hi. This was a true privilege, and a very rare opportunity. Paul again graded for his 5th degree, under General Choi’s son – Master Choi Jung Hwa in October 2004. Grading under these giants of the martial arts world, is an exceptional privilege, and just to do so, requires an immense knowledge of martial arts. Paul is currently a 6th degree internationally recognised instructor and international examiner. October 2004 was also a time when Paul was selected to be one of three national coaches for the GB-ITF, in the world championships in Korea. Paul’s expert and passionate coaching helped his student get a silver medal in junior black belt heavyweight sparring. Paul’s real vision and teaching skills, have always lead him to make martial arts accessible to all. He believes that a true instructor should understand the balance that is needed to truly inspire students into learning. Whilst never forgetting the discipline in martial arts, students should enjoy their experience, and classes should be inspirational. Paul believes in blending the essence of the true martial arts, with the progression and development of the modern world. It is Paul’s forwards thinking vision that has enabled him and his team to grow from a small group of students, to one of the largest independent schools in the UK in just 10 years or so. He never stops working on ways to improve systems and standards, and is a true professional in the world of martial arts.